Ever since returning from Australia, I’ve missed their café scene. There are 5 cafés on every block in Brisbane, and most offer alfresco seating. Seriously, I enjoyed a latte and something sweet every single day I was there. This afternoon I met up with a friend for coffee at Island Vintage Coffee located on the 2nd floor of the Royal Hawaiian Center. This is probably my favorite café in Honolulu. Great Kona coffee, yummy sweets, and most of all, a charming setting. Their location overlooking Kalakaua Avenue is perfect for people-spying. I start my mornings with a cup of this tea. This tea is made from the African red bush plant and is naturally caffeine free but rich in antioxidants. What I like about it is that it’s a great tasting alternative to caffeine free herbal teas. I hate herbal teas because they taste like boiled potpourri. Rooibos tea looks and tastes like black tea, but it has a very mild, almost sweet and tart flavor. 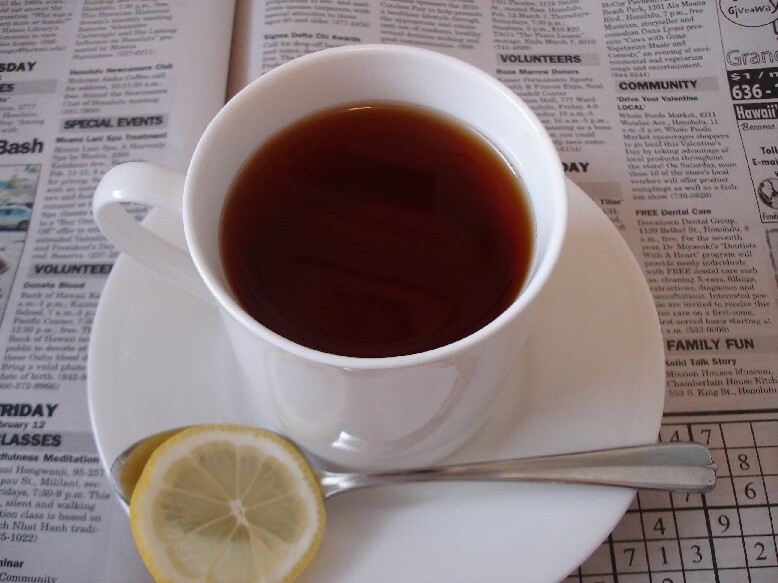 It’s hard to find it in regular local supermarkets – it’s usually sold with added fancy flavors like tropical rooibos or mango pineapple rooibos. But I prefer just plain rooibos tea. I found this box at the grocery store in Australia. Have you tried this yet? It’s a sparkling sake called Hou Hou Shu. I first heard of it from a client a year ago but never had the chance to try it until today, when a coworker gave me a bottle. 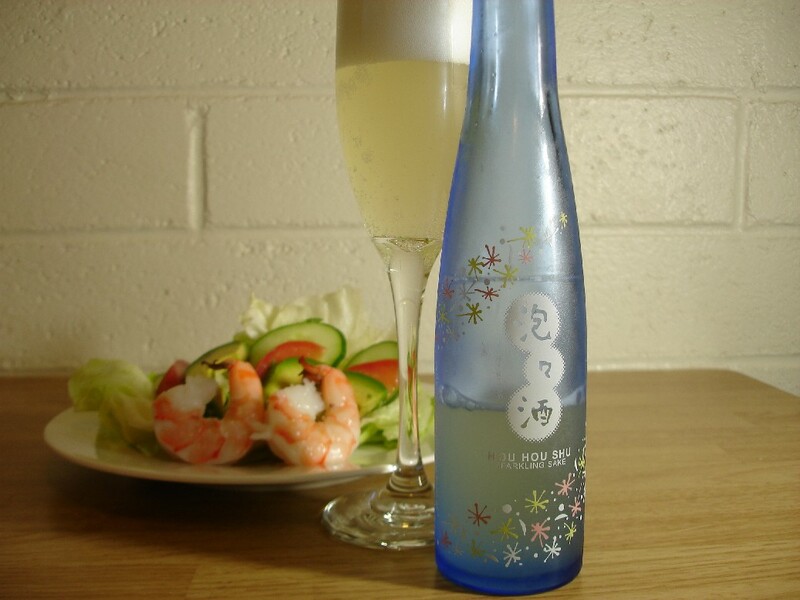 It’s made with unfiltered sweet sake so it has a slight cloudiness to it, and a fine natural fizz. It’s mild and sweet and reminds me of a sweet champagne, but has that unmistakable rice flavor. I love it! Tonight I tried pairing it with an avocado and shrimp salad. Long before Starbucks took over the world, Japanese people got their coffee from quaint neighborhood 喫茶店 cafes and later, from coffee shops like Doutor, which in the 1980s was one of the first large coffee chains in Japan. But still, your choices were “American Coffee”, Iced Coffee, and maybe Cafe Latte. Now, after the first Starbucks landed in Japan in 1996, more stores and other similar coffee shops are still springing up all over the country. It seems young Japanese have quickly made the transition from regular coffee to Espresso beverages, and have developed critical decision making skills like single or double shot? soy? non-fat or 2%? and tall or grande? We had breakfast yesterday at Tully’s Coffee, one such business that followed Starbucks into Japan in 1997. Everything in the store closely resembles Starbucks, from the menu to the interior with its curved counter tops and pendant light fixtures, and the retail corner displaying coffee beans and travel mugs. There are however 2 differences that make it uniquely Japanese. The first is their portion size. The size of a small cup of coffee is about the size of an American McDonald’s Happy Meal drink (and I say American because even the McDonald’s here has smaller portion sizes), so those of you caffeine junkies will need to order 2 of the large cups. Second, they don’t have decaf! I don’t do caffeine (or sugar, or alochol – some might wonder if my life is worth living) so I had no choice but to order an Earl Grey Tea which seemed like the least caffeinated option. How I do miss my Decaf 2% Sugar-Free Vanilla Latte!